Ask the Glee kids how it feels to receive a fresh cold Slushie to the face, and they’ll more than likely stop believing and lose hold of that non brain freeze feeling. But it’s not just Rachel Berry and Finn Hudson who enjoy licking the sugary sweetness from their lips; I for one would of totally been slushied at school, in fact I love Slush Puppies so much I would of almost been a human ‘Sluppy’ guard; diving in front of anyone who was heading for brrrrr-ville with my mouth wide open just to experience the strawberry taste sensation. I fondly remember accompanying my other on her weekly jaunt to Kwik Save (totally need to write a piece on that retro shopping gem soon…) and while she was deciding between crinkle cut or straight chips, she’d hand me a quid and send me off to the newsagents around the corner for my weekly Slushie fix. There would usually be a small gang of children stood sipping their beverages, but seeing as I had as much street cred as Katie Price’s fashion range and the strength of Cheryl Cole trying to break America, I paid the man and drank mine safely next to my mum and the shopping trolley. 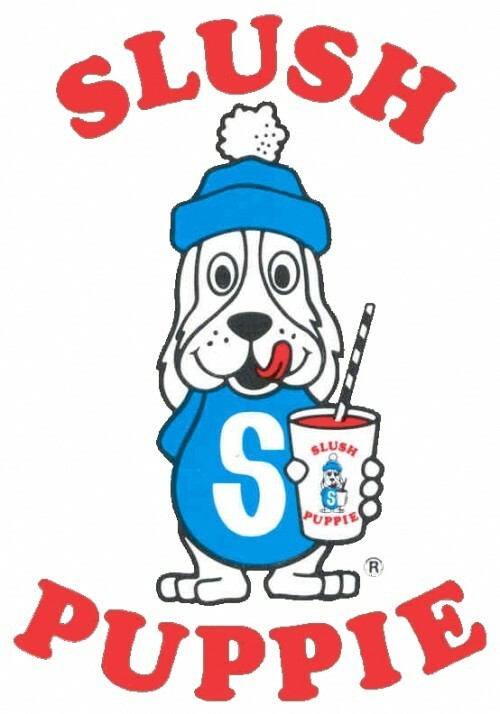 Slush Puppies were first created in 1974 by the lovely Will Radcliff; no relation of speccy Potter star Daniel Radcliff unfortunately. They have since expanded into milkshakes, frozen coffee and the tongue tingly Tango Ice Blasts that we enjoy in the cinema today. Slush Puppies came in two flavours when I was a nipper; strawberry and blue raspberry. However, no one knew that is was in fact raspberry and would often just ask for ‘blue’, almost like a Grand Theft Auto-esque code name for the coolest flavour on the street. ‘I’ll have a medium blue, no straw’. These days I struggle to find the original Slush Puppy, so if anyone knows of any retailers hit me up asap. But now I enjoy the Tango Ice Blasts, which contains sherbet and makes your face turn faster than the X Factor judging panel changes. One of the coolest things about Slush Puppies, apart from the temperature (boom boom, I’m here every week..) is their ability to turn the most serious of adults in to mere children by sticking out their tongue and revealing a Priscilla Queen of the Desert drag queen lizard tongue. You could also raise personal giggles by staring down at your own tongue, before giggling like a group of teenagers crowded round a naughty mag.